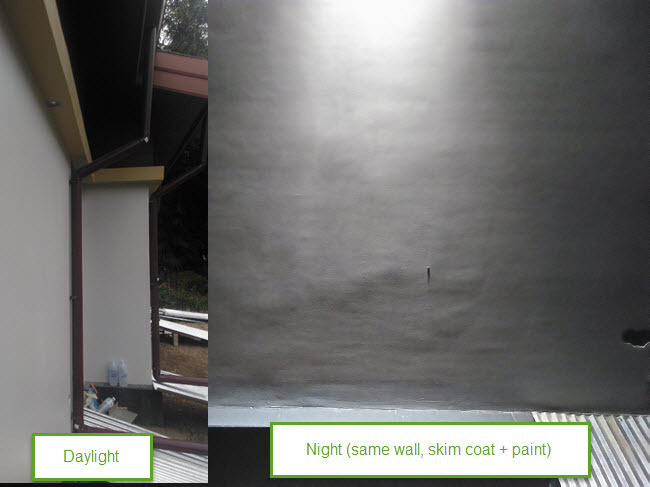 How to skim coat a wall that receive a heavy light at night? I’m polish expat based in Thailand. I’m at the finish stage of building a 150 m2 small house. Basically all work left to complete the unit is just painting job which is turning out to be a nightmare because of uneven plaster with very bumpy skim coat all over interior and exterior walls. Poorly plastered walls. 30-100 cm large and 2-6 mm deep Indentations as well as smaller bumps all over the surface. I think this is not much visible and would not be a problem but I’m guessing that it raises a problem for the skim coat to be applied as the substrate is too much uneven. Exterior surfaces looks pretty much acceptable in a daylight but terrible at night when flushed with lights. There is a sweep at the top of the walls wrapping around whole house. The sweep has several LED down lights which highlight the bumpy skim coat very much. 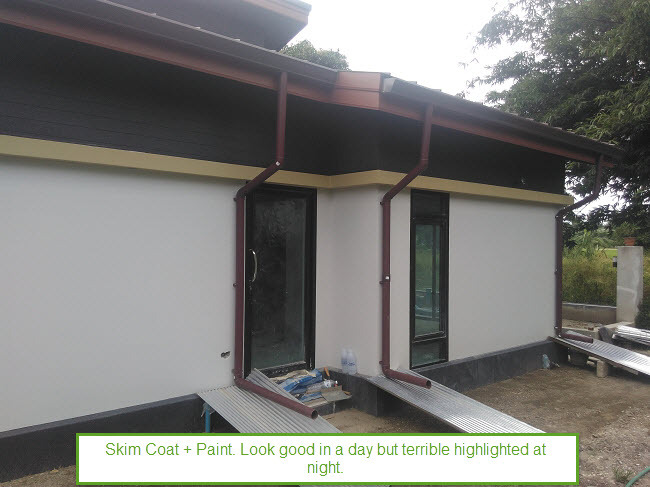 Skim coat is painted with a premium quality Elastomeric paint (eggshell). 2 different tradesman failed to apply the skim coat. After that I decided to learn and complete the job on my own. I have spent weeks practicing, watched and tried many tutorials and advised techniques. I can’t get satisfactory results when wall get lights at night. The short story is that all looks pretty good in a day but turns into terrible mess when highlighted at night. I’m pretty disappointed at this point but don’t want to give up. After so much effort giving up would just break me up completely. Please advise or guide me through. Feel free to ask for additional info or images. UPDATE: After posting this I have got an important addition and more direct question that may lead to a solution. I have realized that one thing making the job difficult is the fact that I can't tell if the surface is smooth enough unless I paint it over with the final coat. I have even tried applying final coat of mud followed by sanding it at night with lights on but even than I can't really say if all is good enough. All bad stuff is just showing up after I paint it over with a final coat of paint. Than, at this stage is to late to make any fixes as there is a need to sand out the paint along with the excess of mud in places where I see the bumps. The paint is to elastic, rips a part and just makes all more difficult. So, my question: Is there perhaps some type of paint that I could use as a tester? I imagine it would have to be easy to sand and have some gloss to cast shadow of all bad places to be fixed. You should take note of Ed Beal's comment above. I am a bricklayer by trade and I have seen this same problem with wall mounted lights on brickwork a lot. The brickwork looks, no, IS spot on, but at night, it looks steppy because (most) bricks are not flat. I'll stick my neck out here and say that it's going to be very difficult to get a perfectly flat surface with cement based coatings/ rendering etc. i.e good enough to shine lights down. The answer is to do what the historic buildings do. Shine the light ON the building (not down it). Not only does this look spectacular, making the house stand out, it will of course totally 'hide' the walls you're not happy with. This usually means lamps mounted in the grounds/bollards etc. and angled back towards the walls. I don't know how well this would work as having never tried it - I've only skim coated interior wallboard and I now know my limitations and stick with knockdown texture and satin paints - but couldn't you use a long straight edge to move along the surface of the wall? Shining a light from the opposite side of the straight edge would show the high/low spots. Then you could spot sand/fill as needed. Not the answer you're looking for? Browse other questions tagged drywall walls finishing or ask your own question. How to salvage this ruined wall so it can hold paint? What is involved when replacing wood paneling with drywall?